The Dow Jones Industrial Average lost 4.6% and suffered its largest-ever point decline at 1,175 on Monday — with the losses continuing to deepen in the overnight futures session, pushing the index down nearly 1,500 points to test its intra-day low. The catalyst was a continuation of the selling pressure seen on Friday related to inflation fears, higher bond yields and faster-than-expected wage growth. There is a lot going on right now in the financial, monetary and political spheres and The Dollar Vigilante Summit, coming up on February 19th, is a perfect time for a lot of the top thinkers in the space to give their take on what is going on and how to prepare for the rest of 2018. Anarchapulco, from February 15-18th, is sold out at 1,500, but many people are still coming down to attend many of the workshops and events which will be before, during and after the event and are able to still watch the entire conference via LiveStream HERE. And there is still space at The Dollar Vigilante Summit if you wish to attend that too. You can find out more HERE. But really, this is about long dormant volatility making a reappearance and shocking overly complacent investors. And boy, was it intense with the Dow Jones down 6.3% at its lows or nearly 1,600 points. The S&P 500 lost 4.5%, while the Nasdaq Composite lost 3.7%. 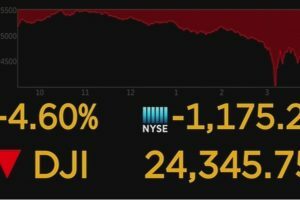 Adding to the intensity and fright of the decline were signs of stabilization near the open, with the Dow Jones actually moving into positive territory for a time as the situation seemed to clear. Then the selling intensified as the S&P 500 and Dow lost their 50-day moving averages. Large caps surrendered their gains for the year-to-date. The Dow suffered its worst point decline ever Feb 5th 2018. Jim Willie tells us this stock market carnage is nothing compared to what is to come… Jim Willie is back and he’s not pulling any punches. Jim says, right off the bat, that we now have the makings of a major financial crisis, just like Jim has been predicting for years now.